I’m a fairly impatient person. I’m also a fairly spontaneous person. Sometimes, I get a wild hair that I just can’t ignore regardless of whatever it takes to relieve the itch. I’m sure you can imagine how that might make some people in my life crazy but, hey, YOLO. Right? Right. Today is one of those days. I’ve just decided to wait three and half hours in line to eat at Franklin BBQ. THREE HOURS. Why? Because I’m in Austin and I happen to be traveling solo. The only one that can suffer from a restaurant mishap today is myself. I’m not gonna lie, all I can think about right now is how this better be the best damn barbecue I’ve ever had. Yes, I’ll be pissed at myself if it’s anything less. Yes, I have a 7 hour drive home after I indulge in an inevitable dietary disaster. Oh well. If I end up with another overly fussed about, mediocre plate of BBQ at least I’ll know and can stop obsessing over Franklin BBQ and move on with my life. I pull around the corner at 9:21 am to a line already wrapped around the building. The small parking lot is already full as well as the intersecting side streets. I’m already second guessing myself as I settle on parking in a makeshift lot down on the street corner. All I can do is shake my head. Let’s face it, the whole idea of what I’m doing is pretty ridiculous. I’m making a conscious decision to wait all morning to pay money for a heartburn inducing gut bomb. What is wrong with me? I question my sanity one last time before I decide to go ahead and hang out with these other folks lined up with lawn chairs and six packs. I guess, at least in Austin, it’s never too early for a Lone Star. How long have these people been here? Where have they come from? The couple in front of me is here on vacation from California and the group of four guys in front of them drove up from Ft. Worth this morning. I think I overheard it was a repeat visit so that’s encouraging. Fort Worth is 3 hours north by the way. As for me, I’m just in town for a conference hoping to top off the weekend with some mouth-watering BBQ. Waiting isn’t so bad…yet. I’ve already taken a little cat nap with my backpack for a pillow and I have another hour or so to get a little writing done before the doors open. I consider myself somewhat of a foodie but not the type you see hunting down Michelin star plates in every city. I’m more of an Anthony Bourdain-inspired gastronome who seeks out flavors even the locals love and in whatever style feels right for the location. Sure, sometimes that’s a Michelin table booked months in advance. More often, it’s a busy yet unassuming establishment somewhere just off the beaten path. It’s placement is as if reserved either for the dedicated or the lost. In this case, it’s a cozy smoke pit tucked away in East Side Austin just far enough from downtown that a tourist would have to be there on purpose – or, you know, completely lost. There’s no doubt that BBQ is a pillar of the Austin food scene and I have had some damn fine BBQ in this city; but, my question still begs, have I had the best? I’ve wanted to eat at Franklin BBQ for a couple of years now. Even though I’ve been to Austin twice in that time frame, a seemingly simple lunch is actually quite complicated. Eating here means devoting at least half a day so there’s no, “let’s grab Franklin’s today” or “let’s pick up Franklin’s on the way through.” That is, unless you schedule at least several days in advance and are willing to order at least 5 lbs of meat. Not your typical scenario. Additionally, Franklin BBQ is only open for lunch and by “lunch,” I mean from 11 until food is out. I hear that’s usually around 2:30. Limited hours and limited supply means like-minded, perhaps crazy, Texans and tourists line up as early as 6 am for a taste of what is recognized as the best BBQ in all of Austin and possibly, the entire US. Still, why?? Other than the fact that I love good food, I don’t really know. Perhaps it’s the curiosity of why both locals and tourists continue to get in line 6 days a week waiting up to 5 hours for a mid-day meal. More so, why they’re willing to do it time and time again. Could it really be THAT good? A couple of hours in, as if knowing our need for a boost, a young lady came out with mini chopped beef sandwiches for those of us who still had a while to wait. Whether it was that I skipped breakfast or their trademark espresso sauce mixed into the beef, I needed that sandwich. That quarter pound or so of chopped brisket folded into a slice of white bread brightened my tired eyes and made me excited to continue waiting for my turn at the counter. Not only do they having cooking the BBQ down to a science, they have serving the BBQ down to a science. Long before the doors will open to get the line moving, we are each given an estimate as to what time we will reach the front. They also know about where in line they will run out of certain meats. This is determined, I presume, by the somewhat preliminary order taken from each person while waiting in line. They let me know ribs would be “risky” for my spot in line just in case I had my heart set on them. I appreciate that they know their supply well enough not to waste people’s time if all they want is one certain thing. After listing off my order, they tell me it will be about 1:00 pm. I arrived at the counter at almost 1:00 pm on the dot. Impressive! We are greeted with a sampling of sliced brisket perfection just in case we were thinking about not ordering it. As I looked around, my eyes quickly got bigger than my stomach. It was evident that was the general effect here since most patrons had more on their tray than one could possibly eat in a sitting. Fortunately, Franklin’s bbq menu is kept pretty simple. You’ve got your meats that you can order by weight and a choice of three sides – beans, slaw, potato salad. The hardest choice is deciding which meats to try so I did what any reasonable person would do… I ordered a little of everything! I was even able to score some ribs. All of that was going home for dinner though and I needed to eat lunch! I like to try signature dishes so I decided to give the Tipsy Texan a shot. The Tipsy Texan is a half pound sandwich piled high with brisket, sausage, coleslaw and pickles. I’m not usually one to put coleslaw on my sandwich but it looked SO good. I decided to just go for it. Guys and gals, if you’re ever there, just do it. It’s amazing. You’re probably thinking,”OK, Jenna. You had some good BBQ but was it worth THREE hours?” Well, three and a half actually and 100% yes. I honestly didn’t see myself saying that at the end of this experience. That sounds really cynical but hyped up food joints have let me down more times than I can count. Not to mention, it’s hard to imagine that a mom and pop stop in East Austin could really be worth a longer wait than the Vatican. See more about my trip to Italy. I guess for those of us who love to travel and eat, it’s all part of the hunt for those elusive places in the world that truly are everything they are cracked up to be. Franklin BBQ is a gem. Hands down best BBQ I’ve had in my life and, chances are, next time I’m in Austin you’ll find me there again. 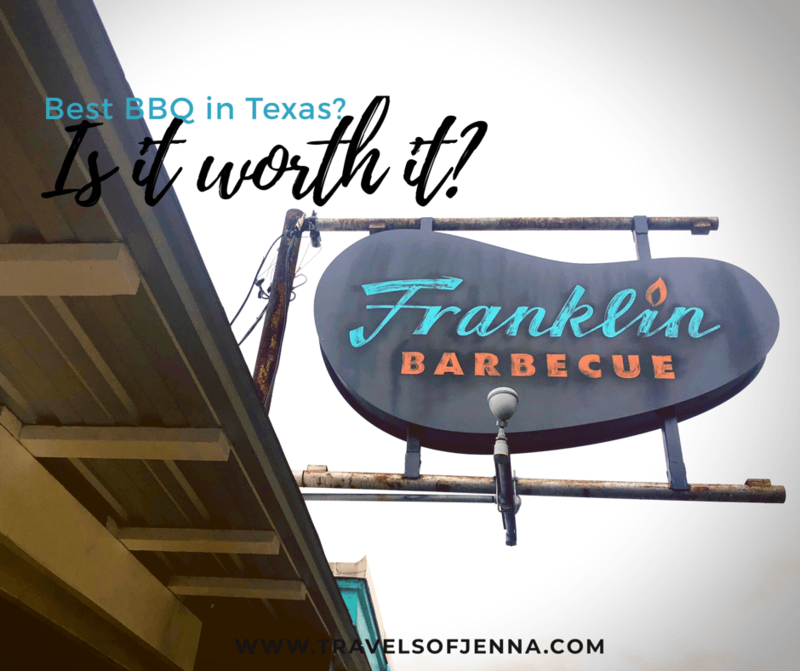 Have you tried Franklin’s BBQ? What’s your opinion on where to find the best bbq in Austin? I’d love to hear from you in the comments!